60km south of Perth. Find your way to the beach at Avalon, south of Mandurah. 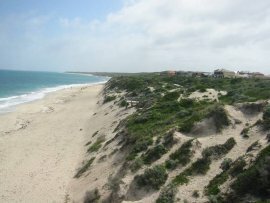 A northwesterly coastal site south of Mandurah. Quite a small site and rarely flown, may be washed away by storms occasionally, but the only NW option near perth. Although only low dunes there can be rotor behind, and the strong winds required to fly can lead to injuries if dragged. Any part of your glider landing in the ocean can be fatal - don't become complacent with regards to these sites. Public road close behind launch at the northern end. Lots of radio controlled models here. This is a public beach so watch out for spectators. Northern Perth. Burns beach is just before Quinn's just north of Joondalup. Take Hodges Drive exit of freeway, turn north at Marmion Ave then west on Burns Beach Road. Park at the end of Burns Beach Road. The dunes are north of the car park. The best launch area is a few minutes walk up the beach at a large blowout. In ideal conditions intermediate and advanced pilots may be able to launch beside the toilet block north of the carpark. 4WD access to the beach further north is possible for those who like to get their cars dirty. Good low beach site for a southwesterly wind. Take off from beach. In a south south westerly only the biggest dune with the blow out is flyable. With a good wind strength and WSW to SW winds several kilometres of flying up to the Mindarie Keys and Quinns Rocks is possible, but it may be necessary to walk a few steps to cross the bigger gaps, especially upwind. Council Rangers may deny you flying this site. This is a public beach so watch out for spectators. Take care not to damage dune vegetation. The alternate launching and landing beside the toilet block can be dangerous due to a complete lack of landing options if you don't stay up or overshoot a landing. Only experienced pilots in ideal conditions should attempt this site. Although only low dunes there can be rotor behind, and the strong winds required to fly can lead to injuries if dragged. Any part of your glider landing in the ocean can be fatal - don't become complacent with regards to these sites. The gullies can exhibit a strong venturi effect, stay well in front in stronger winds. Good beach site very close to Perth but hazardous due to proximity to the road and large numbers of bystanders. Do not fly here until you have read the FlyWA site guide entry. 70km north of Perth. Near Gingin (about one hour north of Perth on the Brand Highway). This site is privately owned. The owner wishes all contact to be through a few people. If you wish to fly this site organise your first flight here with a club member who has good knowledge of this site (Rick Williams, Nigel Sparg or Mark Wild). As with all privately owned sites, this site is sensitive and could easily be lost. 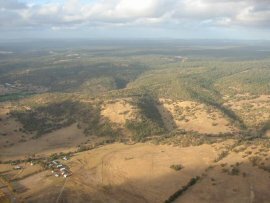 The site is a few kilometres from Gingin, get directions from someone who has been there. Inland site north of Perth. One of few sites that works on the typical SSW summer sea breeze in Perth. In R155 military airspace. Very small ridge, works better than it looks like it should. Nice big grassy launch. If you get low you will be in rotor of the ridge in front, it's best to stay above take off if possible and top land. If you sink out land on the flat area immediately below takeoff. Can be flyable on the summer sea breeze, but generally only late in the day when the strength dies off. Potential for rotor if you get low in front. Low ridge, so flying is usually close to the ground, it is an inland site so potential for strong lift, sink and turbulence form thermal activity. The face is very rocky. It may look the size of a sand dune but it hurts more if you hit it, and the wind is not as dependable as on the coast, be cautious. Probably only safe to fly in smooth evening conditions or in winter, as there is insufficient height to cope with thermal induced turbulence safely. Northern Perth. Most direct access is to park in Merrifield place (see street directory) and take the footpath to the middle of the site. 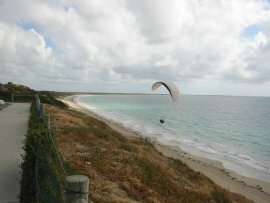 Alternatively a short walk south down the beach from Mullaloo Surf Club will get you there. A nice safe westerly facing dune near Perth. Take off from beach. Take care not to damage dune vegetation. Flyable from the surf club to well south of the stairs, plenty of space behind the dunes before the road makes this a beach site suitable for novices. 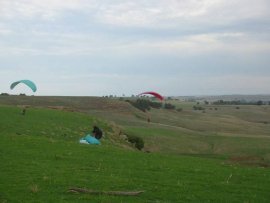 The ridge is only short, however and can become crowded especially in light conditions, be prepared to take turns flying. Council Rangers may deny you flying this site. 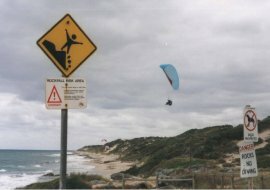 Although only low dunes there can be rotor behind, and the strong winds required to fly can lead to injuries if dragged. Any part of your glider landing in the ocean can be fatal - don't become complacent with regards to these sites. Lots of radio controlled models here. This is a public beach so watch out for spectators. Northern Perth. Quinns is at the northern end of Marmion Avenue. It is the next bitumen beach access north of Burns Beach. Takeoffs can be found along Ocean Drive and at the end of Waterland Pnt at the time of writing. Urban expansion is creating more access to the north all the time. Varied beach site in the north of Perth. After over 30 years of use, in 2018 a licence was approved for a formal launch site. Takeoff is a clear astroturfed area at the top of the dunes. Take care not to damage the dune vegetation in the area. This is a public beach so watch out for spectators. 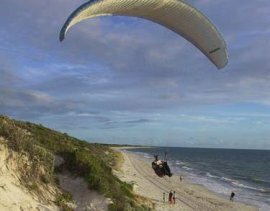 There is potential for long flights to the north, possibly linking sites at Pippidinny road and Yanchep/Two Rocks in the right conditions. City of Wanneroo is to be informed before each days flying. Details are on the sign, on site. 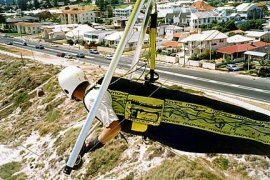 Although only low dunes there can be rotor behind, and the strong winds required to fly can lead to injuries if dragged. Any part of your glider landing in the ocean can be fatal - don't become complacent with regards to these sites. The northern part has many rocky outcrops and beach landing areas may be limited. Do not risk landing on rocks or water. If in any doubt stick to the southern parts of the face where there is a nice wide sandy beach. Some parts of the ridge have roads, houses and powerlines behind. Be very careful flying these parts and consider avoiding these areas altogether in stronger winds. 80km north of Perth. Carry on up Wanneroo Rd past Two Rocks, eventually there is a turnoff signposted to Seabird. About an hours drive north of Perth. Once in town there are several beach access points, any of which will do. The Seabird tavern overlooks one potential launch. Low coastal site with distance potential north of Perth. 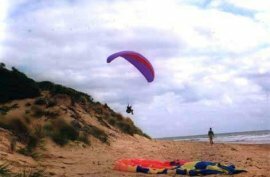 Take off from beach or from cleared areas and tracks at the top of the dune. Take care not to damage dune vegetation. This is a public beach so watch out for spectators. The ridge run to Guilderton (the next town to the north) has been done before. Pleasant flying but possibly a long walk if conditions change. Although only low dunes there can be rotor behind, and the strong winds required to fly can lead to injuries if dragged. Any part of your glider landing in the ocean can be fatal - don't become complacent with regards to these sites. In Seabird itself parts of the ridge have roads, houses and powerlines close behind. Be very careful flying these parts. There is plenty of ridge without obstructions to the north and south of town, so there is no reason to take any risks, particularly in stronger winds. 50km north of Perth. Two Rocks is just north of the Yanchep shopping centre just past the Yanchep Marina off Sovereign Drive. Take the wooden boardwalk to get to the beach and the convenient parawaiting gazebo. 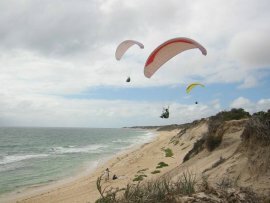 A pretty good beach flying site with a long and steep dune. Take off from beach. Take care not to damage dune vegetation. Council Rangers may deny you flying this site. This is a public beach so watch out for spectators. 40km south of Perth. Park in one of various carparks along Warnbro Beach Road for a southwesterly, or for a westerly further south off St Malo Cove or St Ives Cove. A nice southwest to westerly facing dune near Rockingham. 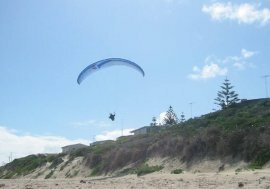 Take off from beach or from grassy park in the northern section (SW wind). Take care not to damage dune vegetation. The northern part is very low, so a strong wind is needed to fly. In the southern part the dune is higher, but finding a good launch can be more difficult due to fences at top and bottom of the dune. Council permission has been gained by HGAWA to fly on the northern part, flying from the park, but walking on the dunes is not permitted.